Perhaps no other element in your home reflects your personal taste so clearly as the cabinetry that you select for your kitchen, bathrooms, laundry room and other areas. Cabinets serve two important purposes: they set the tone of a room's personality and create the system of organization. They are an integral part to any well-used space. Surround yourself with the timeless elegance of Cherry cabinetry. Cherry has a rich long history of being one of the classic hardwoods used for fine furniture and musical instruments. This member of the fine wood family is known for the warm, rich and inviting interiors it creates. Being a natural product, Cherry will change in color almost immediately. Exposure to sunlight will beautifully and gracefully age your cabinets to a deep, rich red patina. 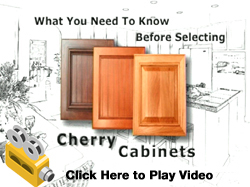 If you choose to add to your cherry cabinets later on, the color will not match your existing cabinets. Cherry is also distinguished by such characteristics as: fine pinholes, grain swirls, pitch pockets, mineral streaks, sapwood and variations in color and grain. These are not flaws but rather features of this elegant wood. Hickory's claim to fame is its natural variations in color and grain. Hickory is not for the timid. It has the most dramatic of variations creating the most dramatic of interiors. The common name for a particular group of trees in the walnut family, Hickory is a hardwood with exceptional strength and durability. Color variations will range from the white sapwood to the reddish brown heartwood even within the same piece of wood. Although, these color variations tend to mellow with age. However, the most striking of variations will be present on cabinets with a natural finish. Other characteristics such as pinholes, burls, knots and mineral streaks will also be present. These characteristics are a result of nature's work and enhance the beauty of the wood. 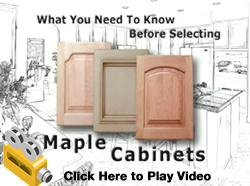 Sophisticated yet simple, maple cabinets are the perfect choice for any kitchen. Maple is one of the hardest and most durable woods. The smooth and subtle grain pattern has a clean, fine textured appearance that is enhanced by its own natural characteristics such as mineral streaks and pitch fleck. Make note that mineral streaks are common and are more visible with darker stains. As maple ages, the color will mellow over time into a rich golden patina. This change is normal and is caused by a chemical process due to the exposure of UV light and the oxygen in the wood. 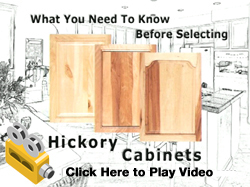 Later additions to your cabinetry will not match in color. The most popular of the hardwoods is Oak. Oak is less expensive than other hardwoods but is known for its strength and striking grain pattern. 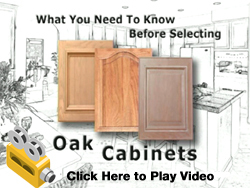 Oak is used for flooring, doors, wine barrels, railroad cross ties, buildings, moldings and much more. The predominate grain pattern ranges from straight lines to arched or pointed flame-like patterns and may be present in the same cabinet door or drawer front. There is a wide array of colors available ranging from light to dark. Unlike cherry, oak is less photosensitive and will not darken but gain a golden glow over time. This is considered normal. Because the color of the cabinet will change, later additions will not match your existing cabinetry. The Thermo foil finish consists of a decorative vinyl-compound sheet that is molded with heat to the wood surface of the cabinet. 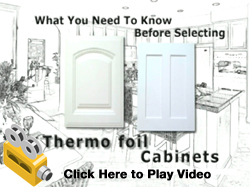 Through this baking process, these cabinets have the look of white painted wood but with the durability of Thermo Foil. Prolonged exposure to sunlight, smoke or chemicals will dull the finish and cabinets or accessories added later will not match existing cabinets.